Elac EA101EQ-G review | What Hi-Fi? Good looks alone do not a happy marriage make. That’s something we need to remind ourselves as we lift the Elac EA101EQ-G from its box, admiring the sleekness of its design. We know that beauty is in the eye of the beholder, but we can’t be the only ones taken by the brushed steel rear and fascia clasping the main body of this integrated amplifier, with minimalist digital display and chunky volume dial. It is both elegant and decidedly industrial, and we’re already finding ourselves hoping it sounds as great as it looks. While the front of this 80W-per-channel amp is relatively minimalist, turn the Elac around and there’s a lot more going on. There you’ll find two analogue line-ins, two optical and one coaxial input, a USB slot – each capable of handling 24-bit/192kHz – and an output for a subwoofer as well as your two-channel stereo speakers. 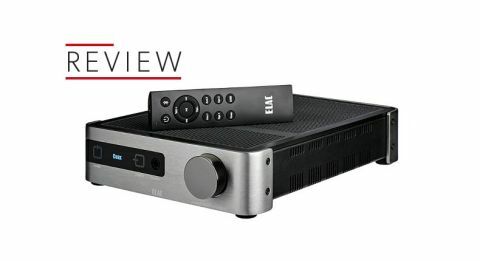 Throw built-in Bluetooth aptX and Dolby Digital Decoding into the bargain and, potentially, you have an impressively flexible home entertainment hub. As well as the included remote control, there is a companion app for Android and iOS users alike. More than just a control app, however, Elac is keen to advertise the included ABC Technology (Auto Blend & Calibrate). This means that if you’re planning to utilise the EA101EQ-G’s capacity for output via a subwoofer, through the app you can calibrate the optimal crossover frequency dependent on the speakers you pair it with. Importantly for anyone planning to use the EA101EQ-G for all their TV and hi-fi needs, it works like a dream. Connecting to Bluetooth, which can sometimes be a pain, happens in seconds, and there is no thinking time necessary when flicking between input options. The user experience is aided by that display. As well as being bright and easily read, you can also rename each input so you won’t have to miss the start of your favourite programme as you flick through the options trying to remember which one is for the TV. Because we want so much for it to sound good, it’s with a little trepidation that we plug our reference ATC SCM11 speakers into the EA101EQ-G and play Biffy Clyro’s Infinity Land. Pleasing, then, that no stains immediately appear on its so far unblemished score sheet. As the electronic opening to Glitter And Trauma introduces the album, there are no hard edges, no evident lack of bass weight, and a definite sudden crescendo as programmed beats are slain by the colossal riff of a raucous three-piece. Or at least that’s how this introduction should end, because, while the volume rises, the authority and grittiness of that riff seems all-but lost. As the verse’s angular rhythm chops and changes the momentum, its sharpness is replaced by a lazier incarnation of itself. Simon Neil sounds as if he’s sung this song 50 times already today and would quite like to go home actually. It isn’t unlistenable by any means – it's a relatively clean, balanced sound that is in no way a strain – but it’s in stark contrast to the energy this record should have. We’re already nervous about pitting the Elac against the Rega Brio we have lined up next to it. We change to Hans Zimmer’s The Dark Knight OST, where the menace in the score is perhaps subtler than with Biffy, but the same issues remain. It’s fine; it’s just fine. There is less detail than the Rega digs out, and a tighter soundstage, but mostly it’s that same lack of emotional insight – the same loose sense of timing and shallow dynamic range – that leaves us unoffended but just as unentertained. The performance across the inputs isn’t quite uniform, however. There is more energy in the Elac using the physical digital inputs than via analogue or Bluetooth. While you sacrifice a certain amount of solidity, that’s certainly the way we would recommend connecting this amp should you decide to buy one. We’d struggle though to make a strong argument for you wanting to do so when the Rega Brio and Cambridge CXA60 are still on the market. It’s a shame, because on paper this Elac has everything going for it. But we know that if we end up together, we’d only end up getting bored and playing around with a different model. Maybe it just wasn’t meant to be.